We are an American-style pizza shop. Our interior is white and stylish with counter seats and tables for larger groups. Many of our staff members come from outside Japan, so we have a very international atmosphere. We make our own dough and bake our pizza in our own oven. That’s why our pizzas have crispy crusts and are chewy inside. We recommend you try our “Santa Fe Pizza”, which is lime flavored chicken topped with onion and avocado dip. This special pizza is only available here. If you’re a vegan or not a meat-eater, don’t worry. We also have a wide selection on the menu for you! We also do half-and-half pizzas, so you can order what you like. 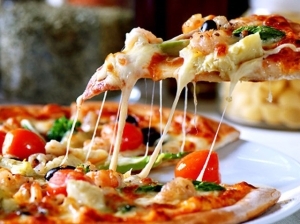 You can enjoy set menus that come with pizza or sandwiches with soft drinks. Have your meal on the terrace on a sunny day! We also have a great line-up of imported beers so you can enjoy a fresh pizza from the oven with a cold beer! 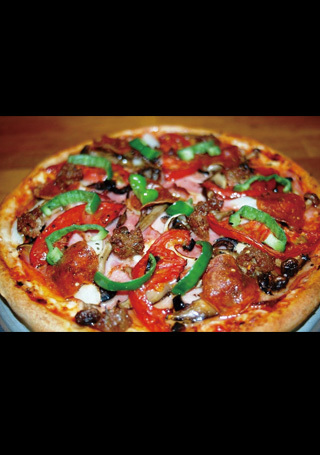 If you’re ever in the mood for a great American pizza, come to “PIZZAKAYA” with your family, date, or friends!